The far southern point of Grand Turk. The south point of Grand Turk, this beach is great place to walk to from the Cruise Center if you want a little seclusion. The beach at Boaby Rock Point, Grand Turk. Boaby Rock Point is the southernmost point of Grand Turk. This secluded area has patches of beach between small rocky sections, and Casuarina trees line the coast. Swimming here isn’t quite as nice as at the Cruise Center Beach (SunRay Beach) and Governor's Beach, but the beachcombing is far superior due to wave patterns and the fewer visitors. The point is a third of a mile (.5km) walk from the Grand Turk Cruise Center. After the point (Boaby Rock Point), the beach continues on as White Sands Beach. Sea fans and coral at the Boaby Rock Point reefs. 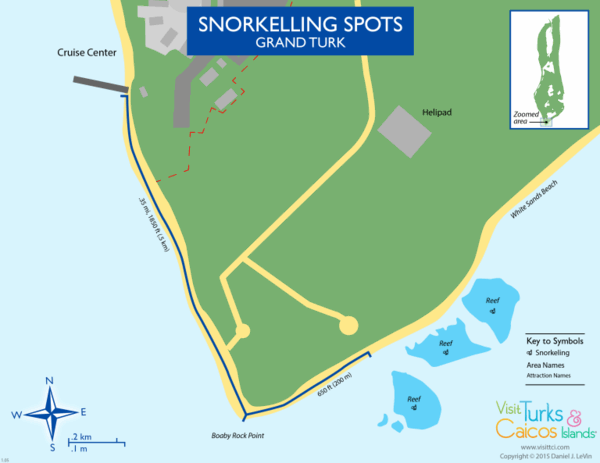 When conditions are calm, two of the best shore snorkelling spots on Grand Turk can be found 700 feet (213 metres) feet and 900 feet (274 metres) feet up the eastern coast from the point. 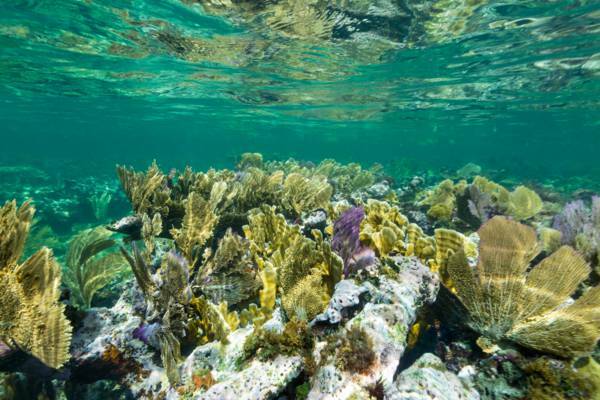 Here, two mid-sized reef systems start in very shallow water and extend out about 300 feet (91 metres) from the beach. There are quite a few different types of coral thriving on the reefs, as well as yellow sea fans and vibrant fish life. The area usually isn’t very inviting from the beach due to rocks, large amounts of seaweed and flotsam. Also due to the copious volume of seaweed, the water in the area can have a greenish tint. However, if it isn’t too choppy, the rewards are well worth the effort. 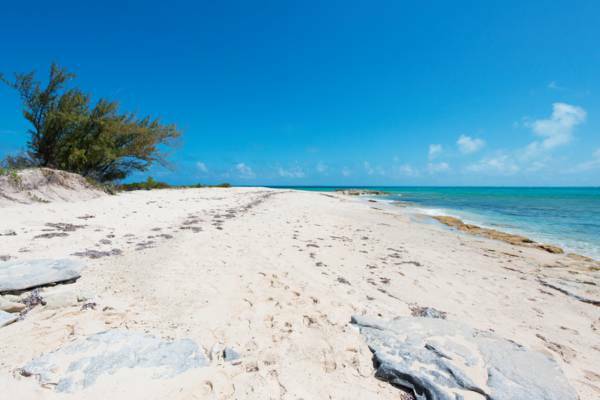 It’s possible to walk the .34 miles (.5 km) south (right if you’re looking to the beach from the cruise ship) from the Grand Turk Cruise Center to Boaby Rock Point. Although the roads can be a little difficult to find, it’s also possible to drive to this beach. An unpaved road follows on the west side of Hawkes Nest Salina (the large salt flat near not far from the Cruise Center) to the beach. You’ll know you’re the right road if you pass the Mountain Air Helicopters helipad. The access closest to the snorkelling reef. The access near the extreme south point of Grand Turk. Last reviewed by an editor on 1 November 2015.